This “smoke-stacked stout” certainly lives up to its description. The presentation is excellent, the beer near black in color and topped with a beautiful beige foam. The aroma then makes it perfectly clear what you can expect in the taste. It’s loaded with smoke and is faintly medicinal, with a pinch of dark chocolate for good measure. The same flavors continue in the mouth, with roasted grains adding a touch of tartness to offset a light caramel sweetness. With more smoky bitterness and burnt grains in the dry finish, this is a liquid bonfire made for smoke lovers. The 5% beer’s pungent aromas and flavors don’t disappoint. 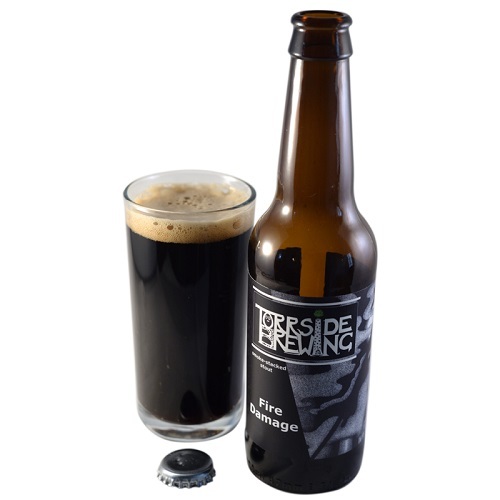 It’s bottle-conditioned and suitable for vegetarians and vegans: In common with a growing number of British brewers, Torrside avoids the use of isinglass finings. The stout is black with a ruby edge and has a superb aroma of roasted grain, burnt fruit, espresso coffee and pungent, peppery hops. Bitter hops build in the mouth, balanced by creamy malt, coffee and dark fruit. The finish is less aggressively bitter, with creamy malt notes building and continuing contributions from dark, burnt fruit and delicious hints of black coffee.